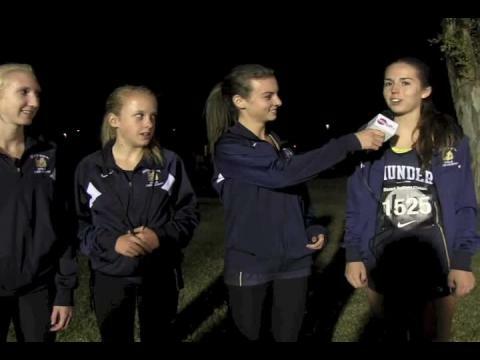 The top 4 Desert Vista girls talk about their races and the team win. Niwot's Jacob Fisk should be among the top contenders in Saturday's Northern Conference meet in Fort Collins. Colorado Track XC file photo. The Lake Braddock cross country team typically takes an annual trip out-of-state and has been picking almost a new meet each year for the past several years. This year the Bruins of Burke, Virginia traveled all the way out to Gilbert, Arizona for the Desert Twilight XC Festival, which gathers many of the top teams in the Southwest Region of the country. The VA #10 ranked Lake Braddock boys and VA #4 ranked Lake Braddock girls both ran impressively to each finish 3rd in the Sweepstakes Races standings, which is the top division race in the meet on a fast 5K course on the Toka Sticks Golf Course in Gilbert, Arizona. The 7 members of the winning Corona del Sol team talk about their team win.